What's the perfect way to organize all the accessories you need in the kitchen? Start with a few Amish Eco Friendly Kitchen Utensil Holder Baskets and you're off to a great start. This handy little basket is just right for spoons, spatulas, servers and all the vital kitchen tools used for meal preparation. On top of adding a stylish organizer to your kitchen, these handmade baskets are eco friendly! Made entirely of recycled plastics, each basket contributes directly to reducing build up in our landfills. Set out these colorful baskets at your next picnic or barbecue. The plastic material is UV treated and resists fading, making it an excellent candidate for use indoors or out! Choose custom colors from a variety of brights and neutrals to match your decor. Select the perfect gift for a friend who runs a green household. 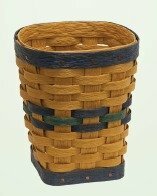 Find more eco friendly gift ideas from our Indiana Baskets Collection today.